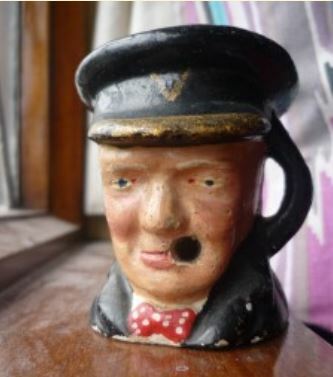 For many years this old Toby Jug of Winston Churchill sat on the mantle piece in our parlour in Cabra West. No one seems to know where it came from or who brought it into our house. There used to be a little brown cigar sticking out of his mouth but it’s gone now. I have no idea how old it is or where it was made. It was certainly in our parlour when I was a little boy. I wouldn’t have seen it very often though because we were never allowed into our parlour except on special occasions like when you made your First Holy Communion. You see our parlour was the tidiest room in our house and was kept especially for visitors. To us little ones it was almost like a Secret Garden. Some Sundays my Dad would go and sit in there to have a read of his Sunday newspaper and my Mam would join him with her knitting. It was no good us trying to peep through the keyhole to have a look inside at them because they always kept the door locked with the key shoved in the lock. We could hear the knitting needles click clacking away and the newspaper being shuffled about alright, for most of the time anyway. They loved to reminisce about when they were growing up in the Monto and talk about the ghosts that haunted the tenement buldings when they were kids. We had a fireplace in our parlour but the fire was rarely lit. It was a black cast iron fireplace, I suppose now we’d call it an antique. I remember one time my mother cut out a square piece of flower covered wallpaper and put it in the fireplace, it looked like a fire-screen. We also had a sideboard in our parlour that came out of town when the family moved from their tenement flat in Gardiner Street. And of course we also had a China Cabinet that didn’t come from China, it came all the way from Cavendish’s Showrooms in town and was bought on the Hire Purchase. My Ma’ kept her best China in that cabinet along with other bits and pieces. Churchill held his place on our parlour mantle-piece along with another toby jug of a pirate with a patch over one eye. There was also a pair of porcelain dogs in the parlour and two swords that my Da’ had brought home from his days in the British Army and an Arab headress that he got in Palestine in 1936.